This week Penn State Extension Educators kicked off their first session of Farm$en$e in Slippery Rock, Butler County for the 2015-16 program year. Farm$en$e is a four session workshop that teaches farmers how to understand financial statements such as the cash flow statement, the balance sheet, and the income statement. Course participants will learn how to use financial records to make informed financial and production decisions. These skills will strengthen the farm business partners. All agricultural businesses including: Livestock, Dairy, Crops, Horticulture Operations including Orchards, Greenhouses, and Vegetable Operations can benefit from Farm$en$e. Pre-registration for the program is required online by clicking on the links above or by calling 877-489-1398. The cost of the program is $225 per farm (limited to two individuals per farm, each additional person is $90/each). Lunch is provided at all classes. For participants of all four sessions who have drafted a set of financial statements for your farm this program satisfies the requirements for Pennsylvania borrowers of the USDA Farm Service Agency Borrower Training requirements for both production and financial modules. Additionally, this program qualifies for four SmartStart credits from AgChoice Farm Credit. 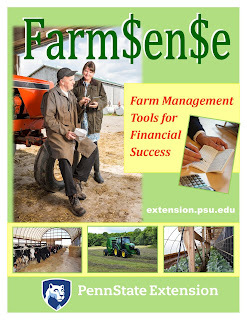 For more information about Farm$en$e please contact Penn State Extension Educator Juliette Enfield at 814-563-9388 or jse15@psu.edu.